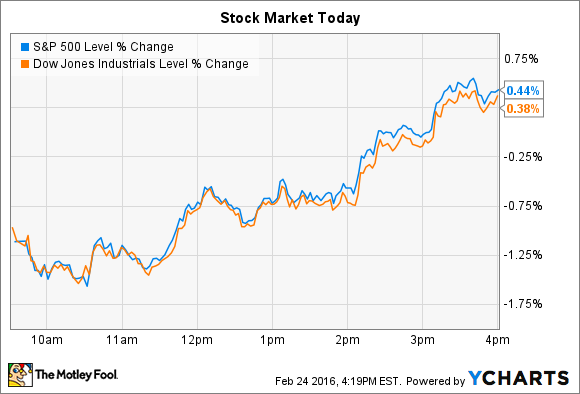 Indexes climbed back from their morning lows to end the day in solidly positive territory. Stocks opened sharply lower, but climbed throughout the trading session to end up in positive territory. The Dow Jones Industrial Average (DJINDICES: ^DJI) added 53 points, or 0.3% and the S&P 500 (SNPINDEX: ^GSPC) gained 9 points, or 0.4%. In economic news, sales of new homes ticked down to a 500,000 unit annual pace in January from the prior month's 544,000, according to fresh data from the government. That figure sat at 1 million on the eve of the housing market crash, but has recovered from a 270,000 unit low set in early 2011 . As for individual stocks, DreamWorks (NASDAQ: DWA) and Avis (NASDAQ: CAR) each made notable price moves today as investors digested the companies' just-announced Q4 earnings reports. DreamWorks' stock rose 22% after the animated film specialist announced surprisingly strong fourth-quarter results. Shares have now gained 19% in the last year, far ahead of rival entertainment giant Disney's (NYSE: DIS) 9% drop. DreamWorks' revenue improved by 36% to $319 million, which trounced consensus estimates for a $274 million quarter. Profits also significantly outpaced the pros' forecasts: DreamWorks earned $0.48 per share compared to the expected $0.16 per share. It's good news for shareholders that the company didn't strike out at the box office in 2015 -- for the first time in years. Profits from its film segment improved to $63 million from a loss of $153 million in 2014 that was powered by unprofitable theatrical runs for Penguins of Madagascar and Mr. Peabody & Sherman. But even better news is the fact that DreamWorks' TV segment doubled in size and now accounts for roughly 33% of the business, putting the company closer to CEO Jeffrey Katzenberg's goal of creating a diversified family entertainment giant whose fortunes aren't completely tied to a few risky movie releases. Disney remains the gold standard in that regard, as its studios, consumer products, media, and theme parks divisions all contributed to record results last year. "There is still much work to be done before we cross the goal line," Katzenberg said in a press release, but DreamWorks at least made good progress in strengthening its business this year . Car rental giant Avis Budget lost a quarter of its value today after posting earnings results that included a conservative outlook for the business. Sales in Q4 ticked higher by just 1%, or 5% excluding currency impacts, while adjusted earnings per share of $0.18 was ahead of consensus estimates for $0.17. CEO Larry De Shon explained in a press release that sales growth was held back by softer-than-expected demand from Avis' commercial clients . 2016 will be marked by slow growth and higher costs, executives said. Revenue should rise by 3% this year, they forecast, compared to flat sales through 2015. The rental giant will see its monthly fleet costs rise to as much as $290 per car, compared to $277 last year. Meanwhile, earnings will also be hurt by $50 million of extra capital spending on initiatives like expanding its Zipcar service and boosting information technology investments. For context, the company generated $313 million of profit through all of 2015. While the investment outlay will generate short-term profitability pain, De Shon believes it's in the company's long-term interest. "Our 2016 earnings outlook reflects incremental investments we are making in our business to enhance the customer experience we offer and expand our long-term margins," he said. Adjusted earnings will sink to about $860 million, compared to $900 million last year and $876 million in 2014.